Last December saw a flurry of controversy over Wikipedia, the free online encyclopedia that allows any visitor to make additions or corrections to its articles. Wikipedia’s premise, that the edits of millions of users will produce a resource of timely accuracy, was dealt an anecdotal blow when a retired journalist discovered himself falsely named as a conspirator in the assassinations of John and Robert Kennedy. BCM decided to administer another test of Wikipedia’s theory with a look at the encyclopedia’s entry on Boston College. Wikipedia was begun in January 2001, but its first article on Boston College did not appear until June 4, 2003. At a mere 214 words, it contained two errors (placing BC in Boston rather than Chestnut Hill and six miles south, instead of west, of downtown). Since then, there have been 446 user edits—each logged and archived to discourage abuse and promote discussion—and the Boston College entry has grown to three articles of a combined 10,500 words. (Encyclopedia Britannica’s entry on the University, for comparison, is two paragraphs long.) The site has endured some pranks—as when a contributor assigned a slight drop in BC’s US News ranking to the departure of a single named student (that text was deleted in three hours). But the balance of outright fact and outright error that marked the original entry has continued, with the accrual of more facts and more errors. Some subtopics now bear embellishments beyond their due; others have meandered in idiosyncratic directions. A look at the ever-changing site on a single day, December 7, 2005, will illustrate. On that date, the entry entitled “Boston College” was peppered with small mistakes: That international students make up 10 percent of the student population (they’re 5.4 percent). That an unsuccessful movement among faculty and administrators to change the institution’s name was motivated by Vatican II rather than a desire for national recognition as a university (the debate preceded Vatican II). That Boston College owns a seaside estate in Cohasset, Massachusetts (it’s owned by the Jesuit community). That Gasson Hall was occupied for 23 days during the 1970 student strike (it was the scene of demonstrations, but not continuously occupied). That 150 Jesuits live on campus, forming the largest Jesuit community in the world (according to Paul Harman, SJ, the community’s rector, 112 Jesuits reside at BC—making it one of the largest). That Jack Kerouac went to BC (he was offered a track scholarship to attend, but matriculated at Columbia). Then there are the gilded edits, made perhaps out of an excess of enthusiasm for the subject: Boston College is “the flagship of the Association of Jesuit Colleges and Universities.” (Actually, the AJCU is a lobbying organization that has no flagship.) The University’s Chestnut Hill campus is “Oxford in America.” John Hume, the 1998 Nobel Peace Prize winner from Northern Ireland, might by rights join fellow classmates at BC reunions (but he was never enrolled at Boston College, which awarded him an honorary degree). Bapst Library is “widely praised as the ‘finest example of Collegiate Gothic architecture in America,’” its Gargan Hall “named the most beautiful room in Boston.” Curiously, those hyperbolic architectural references were added, along with much of the University’s history, in a few large edits by a user at an MIT domain. Wikipedia’s list of notable BC alumni ranges from the genuinely famous (Doug Flutie, John Kerry) to those perhaps added by friends or family. Its account of current faculty mixes the living with the dead and includes individuals who have in other ways passed on or who never arrived. Mary Daly, while notable, no longer teaches at BC, and Bernard Lonergan, SJ, died in 1984. The late poet Anne Sexton, listed as a BC professor, taught at BU. Traditions are born on the Wikipedia site. “Today,” reads the BC entry, “‘Heightsonian’ refers invariably to students, alumni, faculty and others associated with the university. Other monikers include Boston Collegians.” A casual campus survey draws blanks with respect to these terms. A search for “Heightsonian” on the Internet, however, returns 11 results—all iterations of the Wikipedia article. “Boston Collegians” yields similar results. 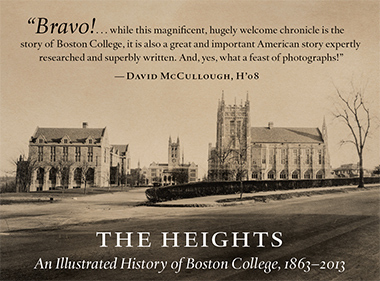 Both terms first appeared in the Wikipedia entry last May, when a contributor wrote: “Heightsonians are persons affiliated with Boston College which is often affectionately referred to as The Heights.” The word’s veracity was questioned by another Wikipedia contributor and changed to Heightsmen. Still another contributor restored Heightsonian with the best of intentions, noting that it is gender neutral. The flourish of “invariably” came later. Some edits defy explanation, such as one writer’s contribution that Boston College was the “first institution in the 400-year history of Jesuit education to construct a building dedicated solely as a library,” and, “O’Neill Library was among the first libraries in the world to digitize its card catalog.” BC was not even the first Jesuit college in Massachusetts to construct a library: Bapst was dedicated in 1928, a year after Holy Cross’s Dinand Library. And the University’s first digital library catalogue—the GEAC Library Computer System—came into use with the opening of O’Neill Library in 1984, certainly not behind the times (the Library of Congress finished its conversion in 1981), but not among the very first. Both statements were posted without comment last spring, again from an MIT domain. They remain unchanged at this writing. In the past five years, Wikipedia has generated some 924,000 English-language articles, according to the site’s entry on itself. That represents a remarkable feat of information and error sharing. To conclude that the process is flawed after so few years may be shortsighted—Diderot’s Encyclopédie took more than 20 years to produce, after all. But as the entry labeled “Wikipedia” notes, any or all of the website’s articles are, by virtue of the “open nature” of the editing process, subject to “inaccuracy, inconsistency, uneven quality, and unsubstantiated opinions.” In the best scenario of the Wikipedia theory of natural selection, errors will be stricken faster than new ones appear.